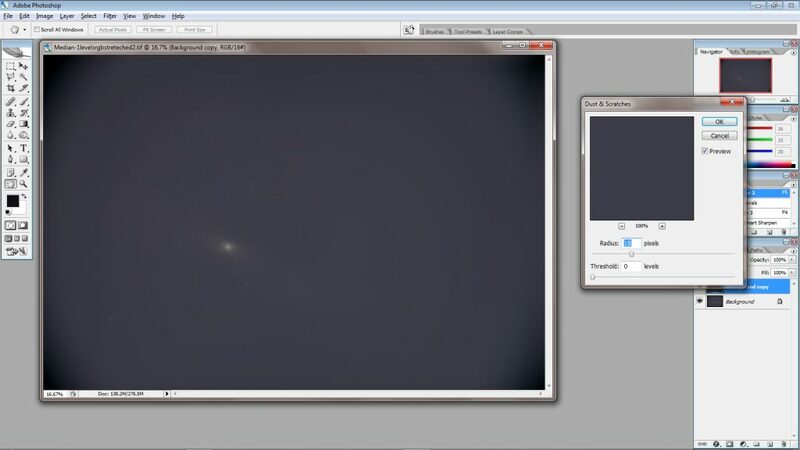 Imaging nebulae under light polluted skies is really not very sensible. Any extended emission within the nebula that is fainter than the veil of light pollution cannot be imaged no matter how large the telescope or how long the exposure time. So why did I attempt this? It was simply a ‘proof of concept’ exercise to try out the control of my Nikon D610 full frame DSLR using the qDslrDashboard App running on my Samsung Android Tablet. This App is described in detail in a further essay in this digest. 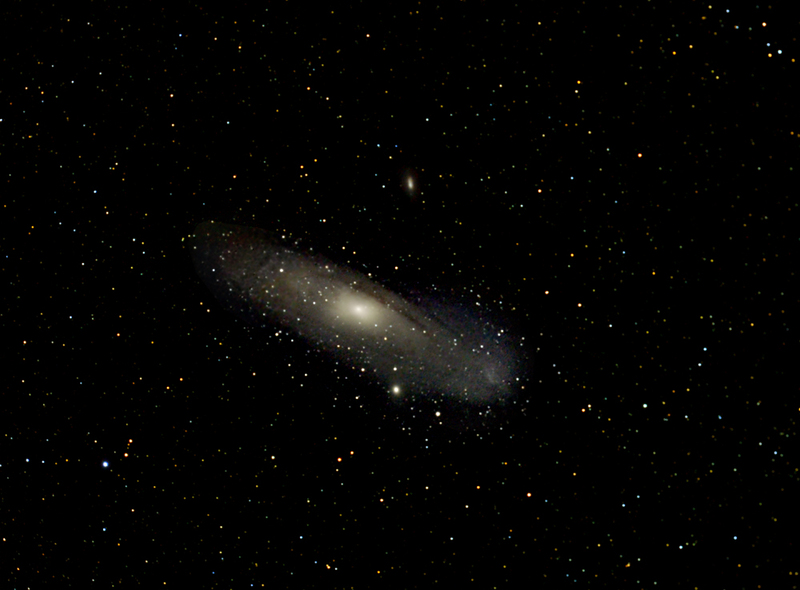 As I had expected, the processing of the data was difficult and the result was not too good, but the several techniques used to produce the final image can be applied under far better conditions so I felt that it might be worth describing how the final image was made. I had chosen to couple the camera to a Telescop Service ‘Imaging Star 65mm f/6.5 Quadruplet Astrograph’. The telescope uses a triplet objective employing one FPL-53 element and an ED glass field flattener element within the tube assembly. It claims to have an imaging circle of 44 mm. The full frame sensor of the Nikon DSLR had a diagonal of 43 mm so I was intrigued to find out if the full frame would be fully covered without vignetting and that it would give pin point stellar images across the frame. A helical rack and pinion focuser is employed which is far better for supporting cameras than a Crayford focuser. The light pollution was a combination of orange skyglow from street lights and blue light from the near full Moon that was rising in the east. Observing the Liveview image on the tablet, no stars could be seen, so the ISO was set to 1,600 and a sequence of 5 second exposures (so that stars could be seen) were taken as the focus was adjusted. Unusually, I could focus the camera without having to use a focus extender as with most of my refractors. Nearing focus, each displayed image could be zoomed into by spreading two fingers outwards on the tablet screen and so I was easily able to set a precise focus − the main reason why I wanted to use tablet control of the DSLR. A total of 80, 20 second, exposures at an ISO of 1,600 were taken under the control of the qDslrDashboard App and which were saved as JPEG files. The long exposure noise reduction was not employed as this would have halved the imaging time and actually increases the noise in the image somewhat. It would have removed hot pixels, but Deep Sky Stacker (DSS) will remove these in any case. The 80 frames were imported into Deep Sky Stacker which aligned and stacked them. I wanted to see if there was any vignetting in the corners the field so deliberately did not take and import any light frames whose use would have corrected for it. 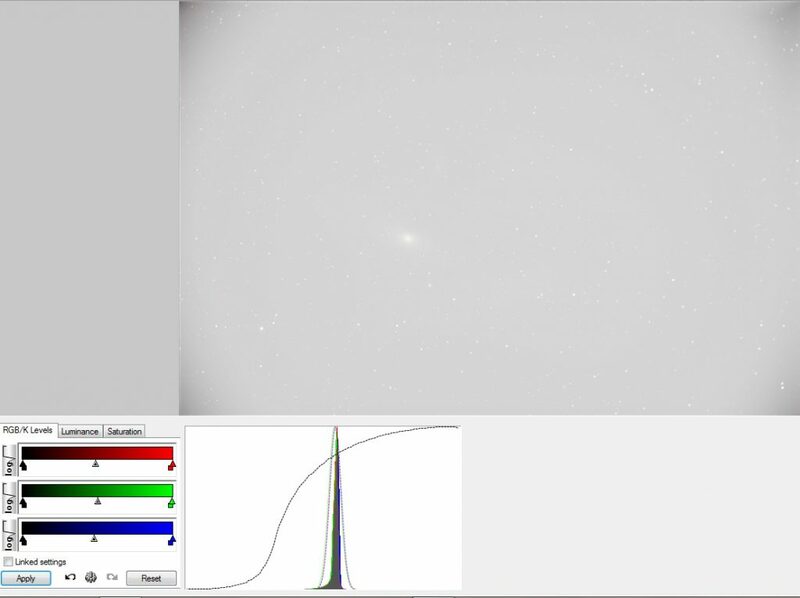 As seen in the screenshot below, the blue histogram was to the right (due to the moonlight) with the red histogram (skyglow) between it and the green histogram. Some vignetting can be seen in the extreme corners. 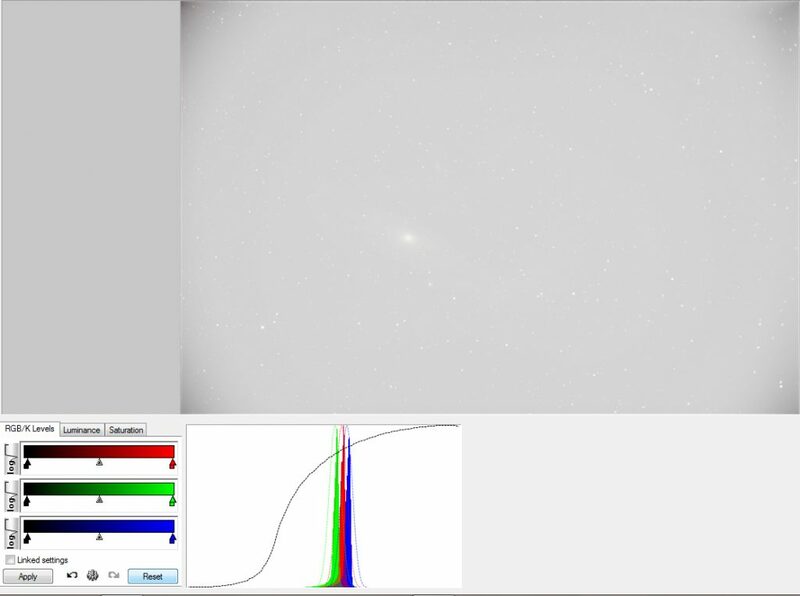 The blue and red histograms were shifted left to lie above the green histogram and the result saved. The image was imported into Adobe Photoshop and stretched by applying two applications of the levels tool with the central slider moved over to the left to give the value 1.20. This image was duplicated and the ‘Noise and Scratches’ filter applied with a radius of 18 pixels. The stars disappear. 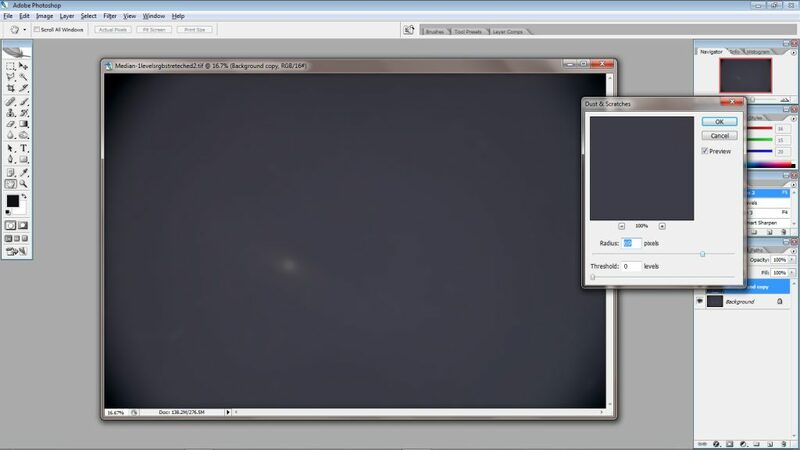 The ‘Gaussian Blur’ filter was then applied with a radius of 68 pixels. 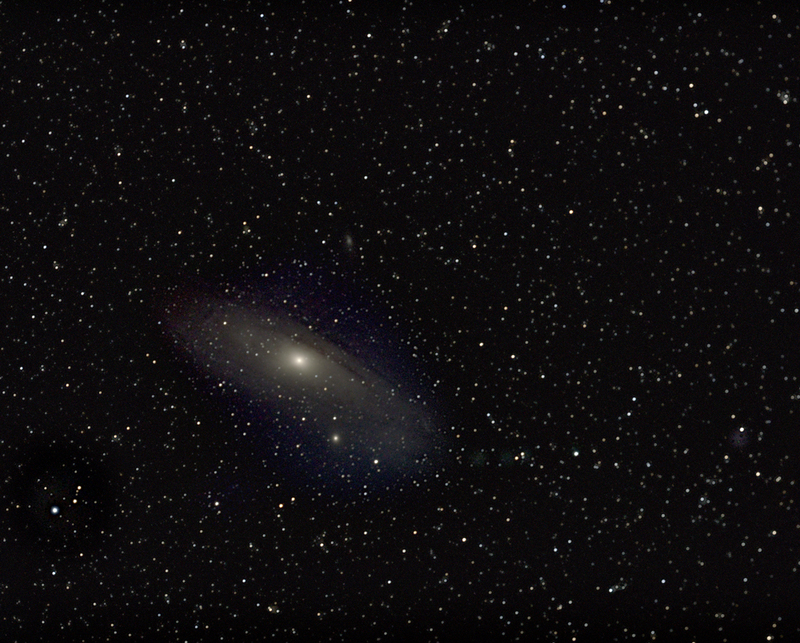 This gives a smooth field representing the light pollution, but with the centre of the galaxy, M31 showing through. The result can then be stretched further and was cropped somewhat. 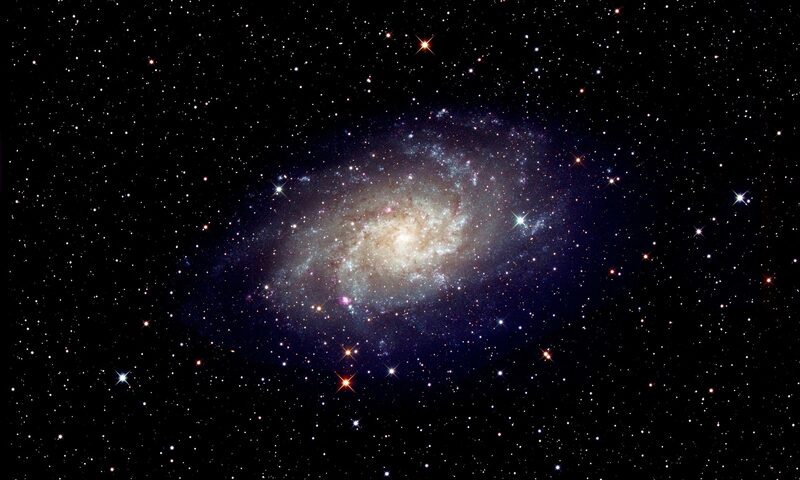 Looking in detail at the galaxy, it was seen that the outer parts were very noisy. These areas were selected in turn and each selection turned into a clear mask with the remainder of the field pink-red. This is achieved by clicking on the mask icon which is the right hand of the two buttons at the bottom of the tools menu. 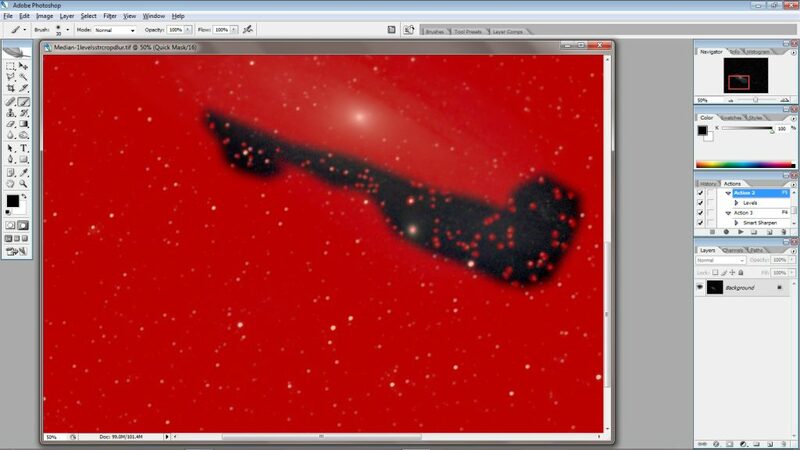 The paintbrush (which has been given the same pink-red colour) is then used to ‘spot’ out all the stars in the region. By then clicking on the left hand button the normal ‘marching ants’ selection appears, but now the stars are not selected. 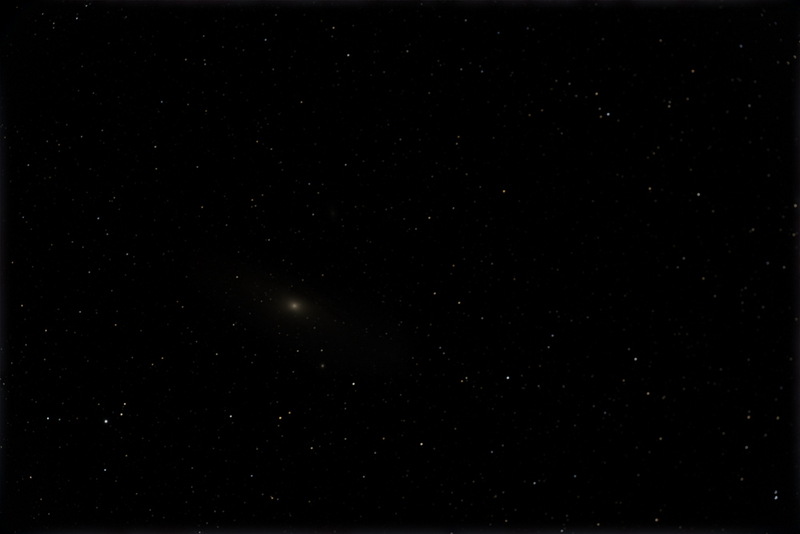 If a Gaussian Blur filter is now applied with a small radius, the background is smoothed but the stars remain sharp. Two further enhancements were made to the image. The galaxy region was selected and inverted to select the remainder of the field and the ‘Hue Saturation’ tool used to increase the saturation of the star colours somewhat but so that the galaxy would not be touched. The image was then doubled in size (setting percentage 200 in image size) and the ‘Minimise’ filter (within ‘Others’) applied with 1 pixel radius. This reduces the star sizes to make them look sharper. The image was then brought back to its original size (using percentage 50 in image size). There is no great merit in this final image. 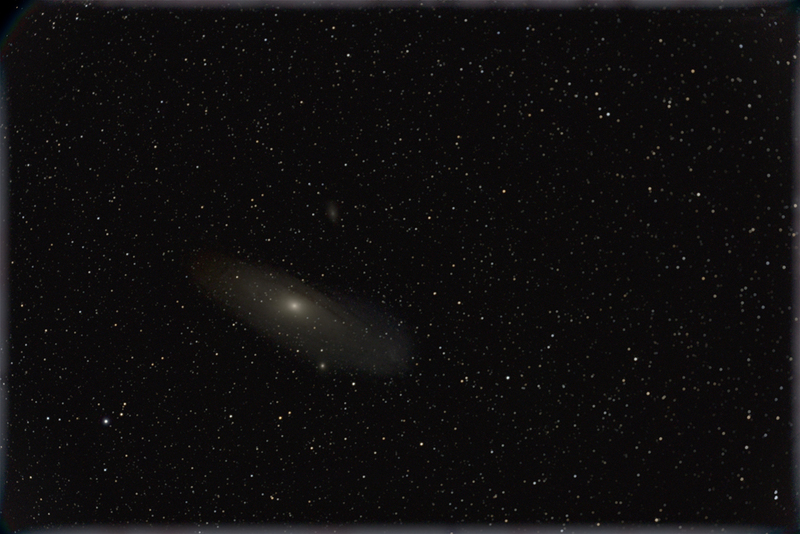 It does show M32 and M110, but the more extended regions of M31 are not visible having been masked by the light pollution. I think that the exercise has shown that with perhaps an integration of one hour taken from a dark location with no moonlight might well give a good result. Perhaps quoting an image circle of 44 mm for the quad astrograph is a touch optimistic. The use of ‘flat’ frames would, however, bring up the extreme corners of the frame. As it is, no vignetting at all is seen across a diagonal of 36 mm, which is still pretty good, and star images were excellent across all but the very extreme corners. 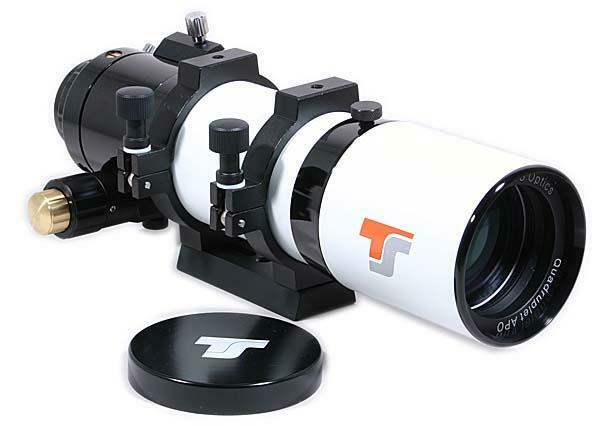 It is a good telescope.